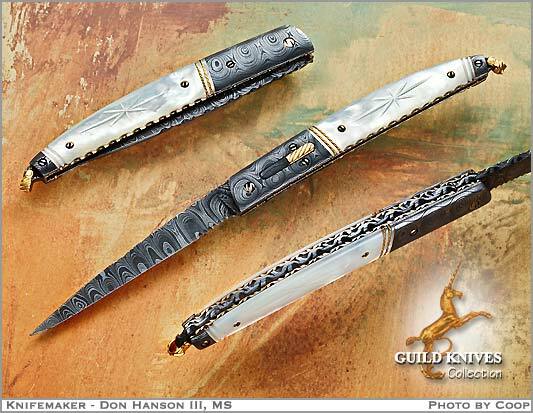 Don Hanson III is one of only a few knifemakers who is a member of both the ABS and the Knifemakers Guild. He makes some of the most delicate but sturdy folding knives in the knife world. Here we see his multiple talents in his forged damascus blade and bolsters, the carved gold bail, the gold auto release bar, inlayed gold wire, and delicate filework throughout, not to mention the nicely carved MOP scales. A subtle feature of this top quality auto is the 1 inch solid gold carved bar inset into the interior of the knife. It effervesces quality.